In the public realm, Res Publica is said to be comprised primarily of an affiliation of three key individuals; Tom Perriello, a pro-war (former) U.S. Representative who describes himself as a social entrepreneur; Ricken Patel, consultant to many of the most powerful entities on Earth and the long-time associate of Perriello; and Tom Pravda, a member of the UK Diplomatic Service who serves as a consultant to the U.S. State Department. Prior to this, Res Publica concerned itself with “catalyzing a resurgence of the prophetic and progressive religious voice in America” through its “Faithful America” campaign. In 2004, co-founders Patel and Perriello, working with the National Council of Churches (among others) launched Faithful America; an online movement-building social media initiative that would serve to be the religious version of MoveOn.org. 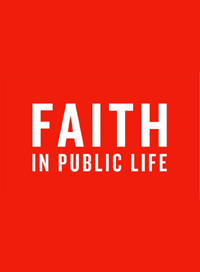 [“FaithfulAmerica.org is using the internet to connect up faith communities and individuals and enable a ‘viral’ form of activism that allows ideas and actions to spread rapidly. Within its first six weeks, ‘FaithfulAmerica.org’ had attracted over 100,000 members. In its first 6 months, it raised over $400,000 for progressive religious campaigns.”] As with MoveOn, and Avaaz, Faithful America is also a recipient of grants (two grants of $400,000 in 2008) from the George Soros Open Society Institute. Patel is also a former director of Faith in Public Life (launched in 2006), which acquired Faithful America in 2007. It is common knowledge that religion has been used a tool for societal control and conditioning throughout EuroAmerican history. Res Publica advisory board members include Eli Pariser, Co-Founder and Executive Director of MoveOn.org PAC and co-founder of Avaaz; Zainab Bangura, former World Bank civil society advisor and former board member of George Soros’ Open Society Institute; Anthony Barnett, editor of OpenDemocracy.net; and John Podesta (quoted above), former Chief of Staff to President Clinton and president and founder of the Soros-funded Center for American Progress. In its infancy, the Center for American Progress was heavily invested in building a religious Left movement. Res Publica serves as an unassuming yet solid foundation for supporting neo-liberal infrastructure, a quiet clearinghouse for initiating projects and ideologies that promote neo-liberal and foreign policy agendas in countries across the globe. The project leader of this E-advocacy report was none other than Ricken Patel, co-founder and executive director of Avaaz. In 2008, Res Publica allocated $500,000 to the Avaaz project. Res Publica currently receives the majority of its funding from George Soros’ Open Society Institute, which donated $250,000 to the organization in both 2007 and 2008. Featured on the main page of Res Publica is the International Crisis Group. Ben Brandzel is Campaign Director and Founding Board Member of Avaaz. Brandzel has also been cited as secretary and treasurer of Avaaz. As well, Brandzel is a consultant to NGOs and “progressive” political parties globally. Ben serves as Director of Strategic Incubation at Citizen Engagement Lab, based in Washington and Berkeley, California. His task is to conceive, construct and launch new “progressive” online organizing communities in the United States and across the planet. “Former and current MoveOn employees have colonized activism internationally with behemoth second-generation clicktivist organizations, like Joan Blades’s MomsRising, Eli Pariser’s Avaaz, and Ben Brandzel’s GetUp and 38 Degrees. It is worth noting that past MoveOn employees communicate via a private email list and thereby accomplish one of their greatest deceits of all: using their organizations as mouthpieces to celebrate each other publicly without disclosing their back-room personal ties. Even those without direct connections to MoveOn often share the common feature of being wealthy technocrats whose startups were bought by a mega-corporation. Into this category fall individuals like Aaron Swartz, early developer of Reddit (now owned by Condé Nast) and founder of the Progressive Change Campaign Committee. And some, like James Rucker, are both former MoveOn employees and rich technologists. Rucker co-founded, with Ian Inaba, the Citizen Engagement Laboratory, also in Berkeley, the umbrella organization that has adopted the ethically dubious approach of using a shared technology platform and overlapping staff to target niches while maintaining the illusion that there is no connection between the subsidiary organizations: ColorOfChange for African-Americans, Presente for Latinos, GetEQUAL for LGBT people and Food Democracy Now! for the organics movement. Many brand names, same company. Clicktivists leverage market segmentation and economies of scale to neutralize real dissent. White resigned from Citizen Engagement Lab in disgust. 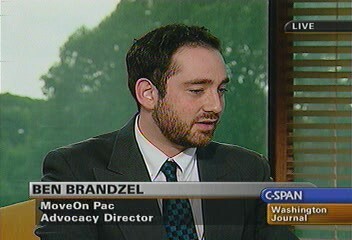 As well as being a senior advocacy director to GetUp!, Brandzel was an advocacy director for MoveOn, helping MoveOn become the largest electoral network on the internet. Recently, Brandzel has been working with the 1Goal education campaign and at LeadNow.ca as a Founding Advisor. Ben Brandzel’s knowledge of social media is so knowledgeable that his services were requested by none other than Barrack Obama; Brandzel served as Director of New Media Campaigns and Fundraising for the Democratic Party and Organizing for America (successor organization to the Obama campaign) and the North Carolina Online Campaign Director for Barack Obama. Brandzel was successful in the mobilization of 20 million supporters for Obama. In addition, he worked for the presidential campaigns of Howard Dean and John Edwards (Director of Online Engagement). Brandzel is also Chief Founding Advisor / Director of the UK’s 38 Degrees.org.uk, an online advocacy organization formed in 2009, which operates in a similar manner to Avaaz. The 38 Degrees Board consists of Gordon Roddick, co-founder of The Body Shop International; Paul Hilder, former Director of Campaigns at Oxfam, GB, former Campaigns Director of AVAAZ.org and Vice President of Global Campaigns at the for-profit Change.org; Ben Brandzel; Peter Myers(formerly Special Projects at Greenpeace and The Climate Group, a Rockefellers’ incubator for an in-house project that later evolved into a free-standing institution) whose first 12 years of his career were spent in corporate finance; Benedict Southworth (formerly with Friends of the Earth, Greenpeace and Amnesty International); Henry Tinsley (former chair of Green & Blacks Chocolate, owned by Kraft); and Gemma Mortensen who worked previously in human rights posts for the International Criminal Court,an instrument for enforcing neocolonial interests in Africa. After attending the exclusive Athenian Boarding School, Brandzel attended Brandeis University majoring in Politics, Sociology, and International and Global Studies. Brandzel, along with his cohorts, has recently taken a position of U.S. Advisory Board Member for SumOfUs. During the 2004 U.S. presidential elections, Slezak, with financing from George Soros and NATO Supreme Commander Wesley Clark, directed online strategy for a campaign opposing the Bush administration’s foreign policy. During university, Slezak worked on development economics and game theory. He is a fellow at Australia’s Centre for Policy Development and has hosted community radio shows in Sydney and New York City. Slezak’s technical work has been published in peer-reviewed journals, including Science and Nature. Slezak has been working with the ONE Campaign (Avaaz campaign partner) in Washington to develop a 3-year strategy for increasing “developed-world assistance” to developing nations. The “ONE” board of directors is incredible and must be read in full to truly appreciate the full scale of whose interests such NGOs truly serve. Board members of ONE.org include director of the Bill Gates Foundation’s Europe, Chief Executive Officer, Bill & Melinda Gates Foundation, the Senior Advisor to the Open Society Institute and the Open Society Policy Center, former Chief Executive Officer of Viacom Inc., the Managing Director of the World Bank. Read the full Board list here, the Africa Policy Advisory Board here and the “Leadership” Team here. Many a number of Avaaz affiliates have been groomed by McKinsey & Company and Slezak is no exception. Slezak is a Management Consultant at McKinsey & Co, where he advises public, private and social sector clients on strategy. 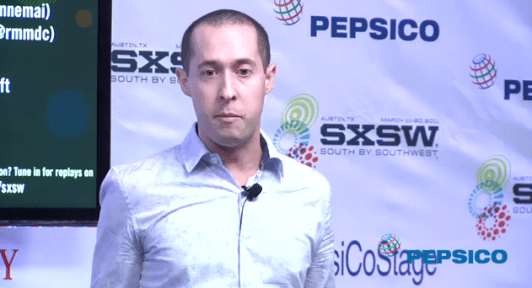 Nate Pinsley, Senior Strategist at Purpose.com has also been groomed by McKinsey & Company. Slezak is a fellow of the Centre for Policy Development. Like many of his affiliates, Slezak has also consulted for the United Nations, in this case on organisational change and science policy. 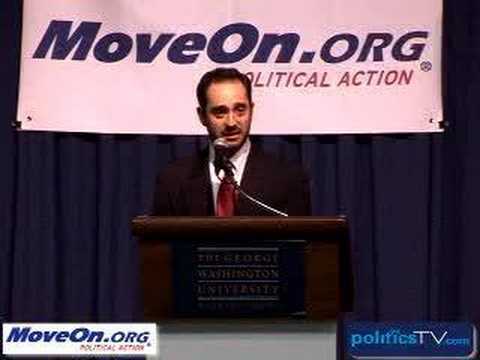 In 2002, MoveOn founders Boyd and Blades hired 32-year-old Zack Exley – a computer programmer and web designer extraordinaire – as MoveOn’s organizing director. In 2003, the Howard Dean presidential campaign hired Exley away from MoveOn for two weeks in order to utilize his skills in Dean’s web campaigns. Exley left MoveOn in 2004 to become Director of Online Communications and Online Organizing for the Kerry-Edwards campaign. During this time, George Soros absorbed MoveOn into his NGO network, assisting MoveOn with a cash injection of approximately $6 million. In December 2003 Jonathon Soros, son of George Soros, collaborated with MoveOn.org on a controversial campaign while corporate media provided massive amounts of coverage for the organization. 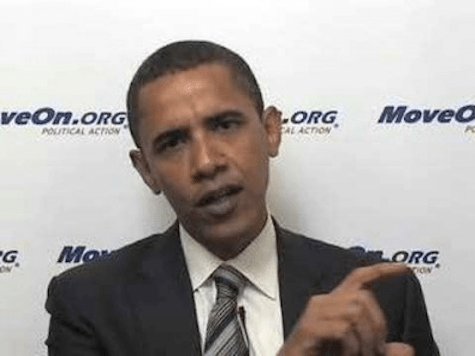 In 2006 MoveOn combined its membership list with that of Res Publica (New York City) to launch Avaaz.org. While MoveOn.org remains fully active, Avaaz.org and other NGOs within the Soros network have replaced the focus of Res Publica. It is critical to note that MoveOn keeps the email addresses provided by citizens who sign SignOn petitions (MoveOn is the “parent” organization of SignOn), reserving the right to use them at a later date. 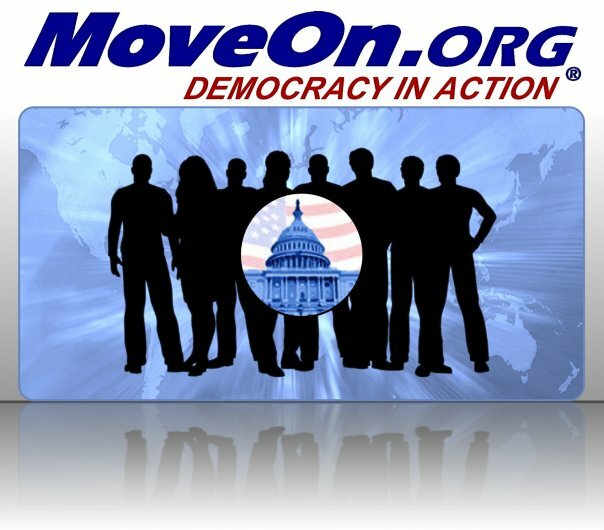 SignOn.org (MoveOn) can be considered a key competitor of Change.org. GetUp was launched in Australia in 2005, by Jeremy Heimans and David Madden, two Australian youth, both graduates of Harvard University’s Kennedy School of Government, where they mastered the intersection of technology, new media and U.S. politics. Heimans and Madden went on to be co-founders of Avaaz, inspired by the success of GetUp, the Australian version of its U.S. counterpart MoveOn.org. As previously noted, MoveOn.org (with Res Publica) founded Avaaz. The GetUp advisory board includes GetUp’s co-founders Madden and Heimans and Brett Solomon, former Campaign Director of Avaaz and former Executive Director of GetUp. Founding board members of this “people’s organisation” include/included John Hewson, former federal opposition leader, former Macquarie Bank Executive Director and Trilateral Commission member; Don Mercer, mining chief, former ANZ CEO, past Director of the Australian Institute of Company Directors; and Evan Thornley, a former entrepreneur and politician with a net monetary worth of $53 million.Don Mercer, Chairman of Orica Ltd. and Newcrest Mining Ltd., spent 19 years with Shell International Petroleum Co. Limited. The national director of GetUp is David Sheikh. David was national vice-president of the United Nations Youth Association. This Australian online political movement became an internationally recognized social movement phenomenon, primarily due to the fact that the organization claims to have more members than all of Australia’s political parties combined. The sad irony is this; Although GetUp, MoveOn, Avaaz and other such organizations brand themselves as the prominent voice of youth, in reality, the people who fund and directly or indirectly shape such organizations are established, influential voices of the exclusive minority; predominantly rich, middle aged, white males. Avaaz promotes the myth of “servant leadership” while willingly collaborating with Imperialist states, globalists, corporate funders/corporate interests and capitalist ideologies. In reality, this demonstrates a very real “corporate leadership” – a corporate leadership whereby Avaaz knowingly strategizes and engages in the purposeful manipulation and cynical exploitation of its members for the benefit of the plutocrats with whom Avaaz aligns itself. Avaaz is not the democratic, ethical forum for social activism it purports to be – rather, Avaaz is a refined, well-greased and well-funded apparatus for extremist political engineering. With regard to ethics, there is what one would like to believe could constitute a major exception in the group of organizations that produced Avaaz. That is the Service Employees International Union (SEIU). This union represents the second largest trade union in America. Often we witness unions demonstratingthat they are interested in issues outside of the imaginary boundaries drawn by governments, as well as issues outside of its own union members’ employment and safety issues. So one must wonder why the SEIU is remaining silent on Avaaz’s opening the door for U.S. Imperialism, when union members in Latin America are calling Avaaz out. No organization can grow to the size of Avaaz without having acquired the respect of loyal followers for credible campaigns. A key method for building and establishing the required credibility and legitimacy is using campaigns that can quite easily generate a fairly broad consensus, that is, ecological campaigns (rainforest protection), “keeping hope alive” on climate, protection of archaeological sites, signing a Fukushima declaration, demanding aid to areas suffering natural disasters such as Haiti. The list, as well as the scope, seems endless. Essentially, what we are witnessing today is a global community that has been recruited by means of whales, dophins, bees and polar bears, and is simultaneously being manipulated into a disturbing global cohesiveness forming an unparalleled pro-war stance by demanding foreign intervention against Libya in 2011, and now Syria in 2012. Libyan Massacre Prevented with help from one million messages to the Security Council. Our messages called for sanctions, asset freezes, and an internationally enforced no-fly zone to protect civilians in Libya. Our voices got through: the UN Ambassador from the U.S., one of the last hold-outs to back the motion, publicly thanked us for our messages. 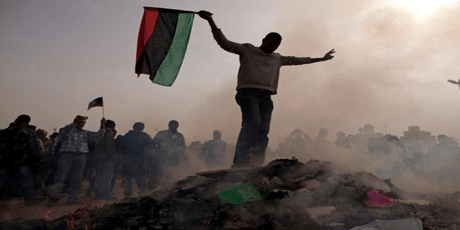 International action began just as Qaddafi’s tanks encircled the rebel-held city of Benghazi — and is widely credited with preventing a likely massacre of large numbers of civilians. The scope of this statement is hard to grasp. Libya, which prior to the Imperialist-led invasion had the highest standard of living in Africa, was left a country annihilated. Our “international action” left tens of thousands of Libyan civilians – and possibly more than 100,000 – dead. After decades of failure by the “environmental movement,” after Environmental Non-Governmental Organizations have failed one hundredfold to the point of global cataclysmic ecological collapse, to the delight of, and as predetermined by their funders, today, within one year’s time, NGOs have proven they do actually possess the capacity to do something very well. While there have been virtually no meaningful successes for either citizens or ecology in decades, NGOs as the primary agents for building public cohesion in demanding wars against sovereign countries have been a tremendous success. Orwell is rolling in his grave. Woodhouse’s specialties are fragile states, conflict, crisis recovery, community development, justice reform, governance and corruption. Woodhouse has consulted for the United Nations Executive Office of the Secretary General (EOS) analyzing UN institutional arrangements in peacebuilding and advised the Secretary General’s office on achieving greater clarity, predictability and accountability in UN support to priority peacebuilding areas (mediation; electoral assistance; mine action; rule of law; disarmament, demobilization and reintegration; and security sector reform). For the World Bank, Woodhouse has designed guidance for analyzing the social impacts of disaster. As well, Woodhouse also peer-reviewed a report: “Civilian Capacity in the Aftermath of Conflict” for the Peacebuilding Support Office. For the United Nations Development Programme (UNDP), Woodhouse has reviewed of UNDP’s contribution to peacebuilding. As Country Officer for the World Bank, Woodhouse represented the World Bank in Myanmar through the ASEAN Humanitarian Task Force, part of the Tripartite Core Group (ASEAN, UN, government). Woodlouse consulted for the World Bank on conflict, crisis recovery and state building issues in Aceh after the peace deal and in Afghanistan and Sri Lanka during periods of worsening conflict. Woodhouse worked for the Institute for State Effectiveness in an advisory role. Her work included an analysis of state-building in Nepal focused on citizenship and inclusion. Woodhouse also advised Ashraf Ghani’s UN Secretary-General bid. Woodhouse was adviser to the Government of Indonesia, advising Alwi Shihab, the Indonesian cabinet minister in charge of coordinating the international humanitarian response to the Indian Ocean tsunami. Woodhouse was a Team Leader and Consultant to the World Bank, establishing “Justice for the Poor,” a pro-poor justice reform program that now operates in Indonesia, Sierra Leone, Cambodia and Kenya. Prior to this, Woodhouse worked on the Kecamatan Development Program, designed an anti-corruption strategy and ran a study on village corruption in Indonesia. Woodhouse’s university studies included international relations, politics and economics. 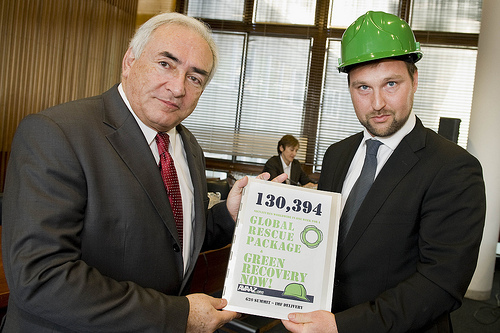 Image: Paul Hilder of Avaaz.org presents a 130,000 signature petition to Dominique Strauss-Kahn of the IMF at Congress House. April 1, 2009. Does this image suggest that the IMF fears Avaaz? Until recently, Avaaz co-founder Paul Hilder was employed by Oxfam in the position of campaigns manager (including the GROW and Robin Hood Tax campaigns). 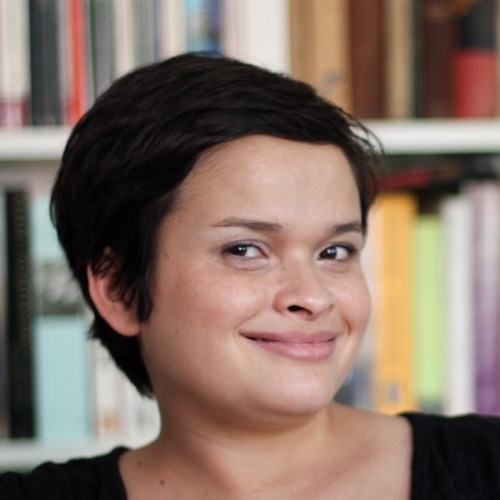 Hilder previously worked in the same role for Avaaz and has written about online social activism for the Guardian. Like his Avaaz co-founder Ben Brandzel, he is a board member of the British organization ’38 Degrees’, as well as a co-founder of the organization. Hilder also co-founded Open Democracy in 2000, where he served as Chief Operating Officer. This organization is prominently featured on the Res Publica homepage. Prominent contributors to Open Democracy have included Kofi Annan and George Soros. Open Democracy has been funded by a number of philanthropic organizations, including the Ford Foundation and the Rockefeller Brothers Fund along with many others. Hilder is also a Deputy Director for the British Council. Hilder is also an author (Contentious Citizens, 2007) and recently joined the SumOfUS Advisory Board. According to the Avaaz website, the Avaaz “community” is “served” by a small team of global campaigners working in many countries to identify and develop opportunities for members to “take action.” Avaaz states that they also rely on teams of “expert advisors” to help develop their campaigns. Avaaz states they have staff based in Rio de Janeiro, Geneva, New York, London, and Washington, DC. Their core campaign team members are Ricken Patel (Co-Founder and Executive Director, Canada; Heather Reddick, Operations Director, U.S.A and Veronique Graham, Executive Assistant, France. Alex Wilks has moved from Eurodad (European Network on Debt and Development, a network of 58 non-governmental organizations from 19 European countries that works on poverty reduction) to replace Paul Hilder as Campaign Director in the UK. Heather Reddick, Avaaz Operations Director, U.S., was Director of Finance & Administration at Let’s Get Ready, International Operations Director at Students for a Free Tibet, and National Operations Director at League of Young Voters. Veronique Graham was ICTE Office Manager at International Center for Tolerance Education. She attended Université de Toulouse-le-Mirail (Toulouse II). Alex Wilks has been a consultant for analysis and strategy; Director at Eurodad; Initiator, editor and blogger at Worldbankpresident.org; Founder and Coordinator at Bretton Woods Project; Campaigns Editor at The Ecologist Magazine, and junior researcher at Jupiter Tyndall Merlin. He attended University of Oxford. Ben Wikler worked for economist Jeffrey Sachs and interned for Sen. Russ Feingold. He also served as editor-in-chief of the Harvard Review of Philosophy. In 2006, Wikler served as press secretary for Sherrod Brown’s U.S. Senate campaign. 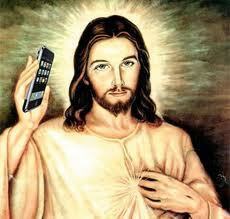 In March 2007, he became Campaign Director for Avaaz, where he helped grow the organization to over 10 million members. Today Wikler is Executive Vice President at Change.org. Stinebrickner-Kauffman should have put down her science fiction books and studied climate science prior to COP15 in Copenhagen. The leadership on climate by Avaaz was nothing less than horrific. 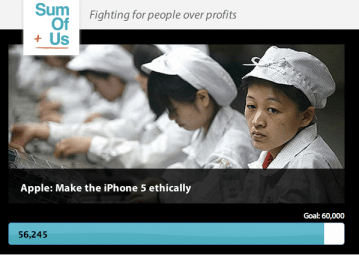 February 1, 2012: SumOfUs posts a popular image used by media outlets today to reflect the worker conditions at Chinese “sweatshops.” “Ethical” capitalism is a fantasy embraced and fetisized by the professional left. Julius van de Laar, a German Campaigner for Avaaz.org, worked for and became a well-known facein the campaign team to elect Barack Obama in 2008 for his new media strategies. Since thenvan de Laar has served as a senior strategist to Germany’s democratic party as well as serving as a consultant to Amnesty International and Avaaz. For Avaaz, and indeed for the non-profit industrial complex as a whole, the psychological elements within strategic campaigns are the key vital components if “movements” are to successfully manage, and thus control, entire societies. Avaaz, at the top of a hierarchy of sister organizations, is able, with very little risk, to test what campaigns are politically palatable and what trends then develop within the consciousness of the selected members/participants. 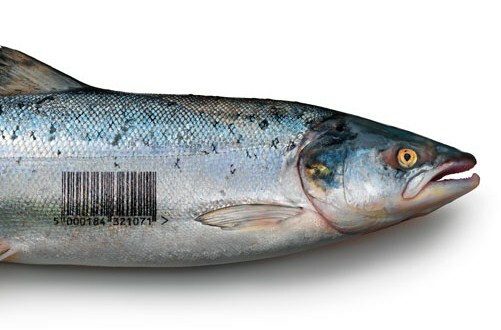 Organizations such as Avaaz can develop ideologies to further shape and mold movements, thus advancing their own ideologies on a global scale. This particular ideology is based on the false illusion of “green capitalism,” serving the interests of the funders, at the continued expense of the planet, and life itself if so required. A “green economy” as a “new way forward” is a foundation based upon deep denialism and fantasy, one that will absolutely, without doubt, fail in the most epic of ways.